This step will depend on how your client will have booked in with you but however that happens, it’s vital that your client feels confident that their booking has gone through correctly, and that they will know how to join the call when the time comes. For me, my clients book through Calendly which sends me an email notification and adds it to my calendar. I then email the client back thanking them for booking in, confirming the time and date, explaining to them where to find the link to join the call and saying that I’m looking forward to meeting them and learning more about them and their business. This email doesn’t take long to write and send, especially if you have a template or automate it somehow, but it makes a big difference in the experience for your client. I don’t know about you, but if I don’t have a plan, I panic, and that is the LAST thing I want to happen in a client meeting. To wow and impress a potential client, I want to be prepared, present, and punctual, and having a plan is the key to this. With almost every client, there is a set of questions that I will always want to know, (tell me about your business/project. What has made you decide to work with a designer now? Do you have any existing branding? What do you want your customers to feel, do and say when they interact with your brand? What’s your timeframe? etc) so I start with those. Then, after doing some research on them and their business, I’ll add some more specific ones for that client about their industry, their business or their goals. I write all of these down in a Google Doc in an order that seems logical in terms of a conversation, leave spaces between them to type and then I’m ready to go. You might not ask all of these questions, they might happen in a different order, or you might talk about completely different things once you get started, but at least you have a place to start, and you won’t be stuck mid-conversation without anything to say! I currently work from home and my desk is in my bedroom alongside my partner's desk, our bed and all of our other belongings, so more often than not, the room doesn’t look as tidy and professional as it could. Whether you’re in the same situation as me, or you have a separate space to work and take calls, it’s a good idea to have a quick tidy up. Before a meeting, make sure that the area behind you is clean, clear and tidy so that there are no distractions or anything that could make the client question your professionalism in any way. As the saying goes, early is on time, on time is late, and late is unacceptable. This is especially important when meeting a client. There is nothing worse as a client than waiting around for the person you’re meeting to arrive or being unsure if you’re in the wrong place so you should be there to welcome them and assure them that they’ve made it and you’re ready for them. Being early also gives you time to get in the zone, get prepared, and be ready in case anything isn’t working or your client has trouble accessing the call. I always aim to be at my computer at least 15 minutes before the meeting to get everything ready and get into the zone and will be on the call 5 minutes before it starts. I’m sure we’ve all had that moment on a video call where someone’s microphone isn’t working, or they can’t hear you, or the video is off for some weird reason and boy is it awkward. To avoid this situation as much as possible, its good to check and make sure that everything is good on your end. Join the meeting early and make sure that your microphone and video are working and the settings are done correctly so that you can hear everything properly. I wear noise-canceling headphones for meetings so that I can shut out distractions, focus on the client, and use the in-built microphone, so I always have to check that in the settings the audio is coming through my headphones and it's using my headphones as the microphone. Checking these things before the meeting will ensure that you’re ready to go when your client joins! A good percentage of clients will inevitably be running late, can’t get into the call for some reason, or might even need to postpone. I recommend keeping your phone, email, or whichever line of communication you use with your client, open until the meeting begins so that you can be on hand for any updates or technical difficulties that may happen. In a client meeting, you want to be completely focused on your client, which means minimising as many distractions as possible. A great way to do this is to be intentional with what’s on your screen and close anything that isn’t relevant. I will usually keep my Google Doc of questions, the call window, and a few relevant browser tabs (their website, social media profiles, any inspiration they’ve sent me, etc) open during the call, and minimise everything else. Another brill tip for getting rid of those distractions is turning on Do Not Disturb. I’m not sure how this works on a PC but on a Mac, you can go to the notification centre at the right-hand side of your menu bar, scroll up, and turn it on. This means that you won’t get any notifications until you turn it back on, so no emails, social media notifications, calendar alerts or anything else will come through and distract you while you’re in the meeting. Same deal with the notifications – put your phone away. I usually still have mine on my desk but once the meeting starts, I put it to the side and turn it over so that I can’t see the screen or anything that might pop up on it. I don’t want anything lighting up in the corner of my eye and taking my focus away from the client, so I make sure it’s out of the way and on vibrate. 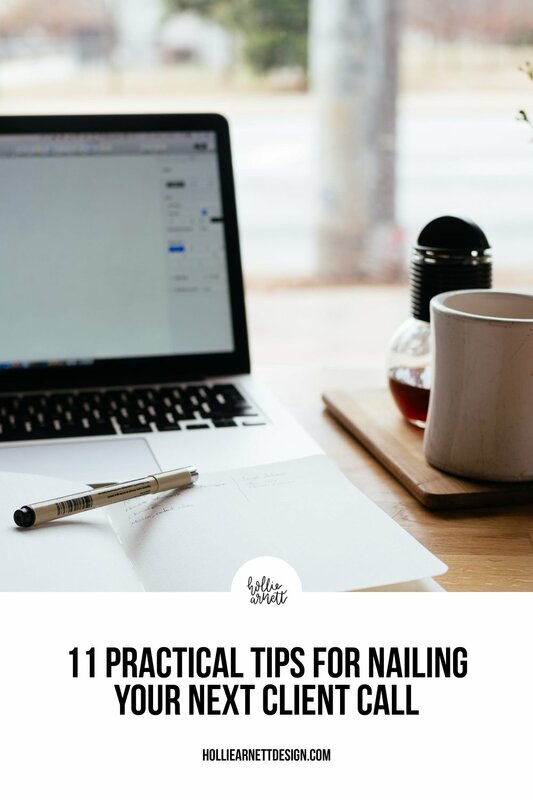 Once you’ve got all of those things out of the way, your client has joined the call and you’ve welcomed them, it’s good to let them know that you’re taking notes. This way if they see you looking elsewhere or can hear you typing, they know that you’re not just ignoring them and messing around on social media or something else, but you’re taking notes on their business and the project at hand. It’s also just common courtesy to let them know that you will have a record of the things you’ve talked about so that you’re being transparent and they’re aware of that. All of these tips and tricks lead to you being able to be fully present in the meeting with your client. You won’t be distracted by notifications, technical difficulties or a lack of questions to ask. Being prepared, professional and present will make these daunting meetings easier and improve the chance of you landing that client! I hope that these quick tips are helpful and make your next client meeting a breeze! A lot of these apply to in-person meetings too, so give them a go whether you’re at a cafe or on a call, and see how you go! I’d love to hear any other tips you have for client calls, and can’t wait to hear how your next one goes!